Abstract. In many tropical regions, the rapid expansion of monoculture plantations has led to a sharp decline in forest cover, potentially degrading the ability of watersheds to regulate water flow. Therefore, regional planners need to determine the minimum proportion of forest cover that is required to support adequate ecosystem services in these watersheds. However, to date, there has been little research on this issue, particularly in tropical areas where monoculture plantations are expanding at an alarming rate. 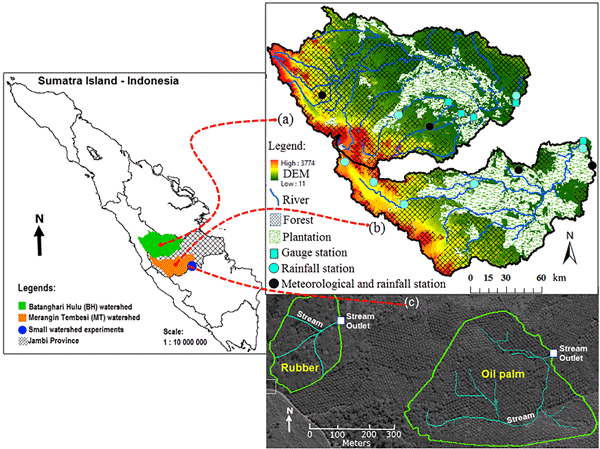 Therefore, in this study, we investigated the influence of forest cover and oil palm (Elaeis guineensis) and rubber (Hevea brasiliensis) plantations on the partitioning of rainfall into direct runoff and subsurface flow in a humid, tropical watershed in Jambi Province, Indonesia. To do this, we simulated streamflow with a calibrated Soil and Water Assessment Tool (SWAT) model and observed several watersheds to derive the direct runoff coefficient (C) and baseflow index (BFI). The model had a strong performance, with Nash–Sutcliffe efficiency values of 0.80–0.88 (calibration) and 0.80–0.85 (validation) and percent bias values of −2.9–1.2 (calibration) and 7.0–11.9 (validation). We found that the percentage of forest cover in a watershed was significantly negatively correlated with C and significantly positively correlated with BFI, whereas the rubber and oil palm plantation cover showed the opposite pattern. Our findings also suggested that at least 30% of the forest cover was required in the study area for sustainable ecosystem services. This study provides new adjusted crop parameter values for monoculture plantations, particularly those that control surface runoff and baseflow processes, and it also describes the quantitative association between forest cover and flow indicators in a watershed, which will help regional planners in determining the minimum proportion of forest and the maximum proportion of plantation to ensure that a watershed can provide adequate ecosystem services. How to cite: Tarigan, S., Wiegand, K., Sunarti, and Slamet, B.: Minimum forest cover required for sustainable water flow regulation of a watershed: a case study in Jambi Province, Indonesia, Hydrol. Earth Syst. Sci., 22, 581-594, https://doi.org/10.5194/hess-22-581-2018, 2018. 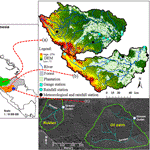 This study is the first to describe the quantitative association between forest and plantation areas and the flow indicators (surface runoff and baseflow) in a watershed; this understanding is required by spatial planners if they are to balance the ecology and socioeconomic functions of a landscape with the rapid expansion of plantation crops. In addition, our study provides data regarding how SWAT input parameters related to tropical plantations such as oil palm and rubber should be adjusted.